The newest version of the POS-n-go application implements restaurant section and table screens. This new way of accessing your open orders is a perfect match for restaurants with table seating. You can create any number of sections for your restaurant and assign each an appropriate name such as Bar, Lounge and Patio. Each section is a separate screen that holds a range of table numbers. One or more orders are then associated to a table. The table information is presented using an easy to identify colour coding. 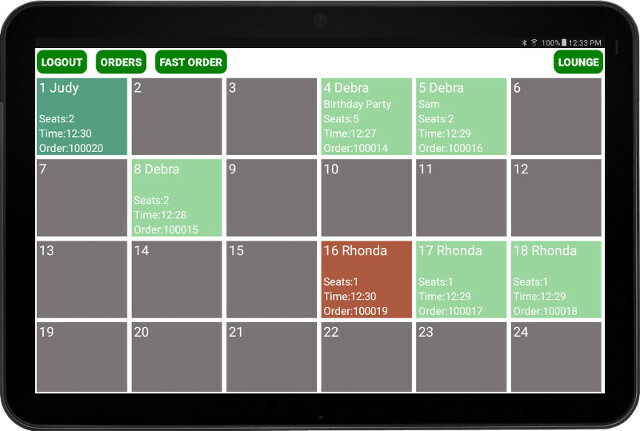 Information such as the table number, server, customer name, number of seats and time seated provide insight at a glance. This new version also includes Item Holds to allow servers to quickly and easily place individual items on hold. Now you can take drink, appetiser and mains orders at one time but release the items to the kitchen at appropriate times. The restaurant view shows tables with items on hold in red to ensure that they are not forgotten. The restaurant view is designed to use with our POS-n-go Sync Box that shares orders between tablets. This powerful combination will streamline your restaurant!